The wide variety of Windows programs and utilities that I use regularly require multiple mouse clicks just to paste rich clipboard material into plain text format. I like to maintain the font size and formatting of the existing document, for example, and don't want the pasted in text to muck that up. Good examples are Microsoft Excel and Lotus Notes. Drop it in any folder on your system, run it, then turn the "Automatically run" checkbox on, and you're all set, it'll start with Windows automatically at your next reboot. Just press "Windows key + V" to paste special text, no matter what application you're using. It makes a cute little noise when you successfully paste content in, but that sound can easily be turned off (see screenshot). 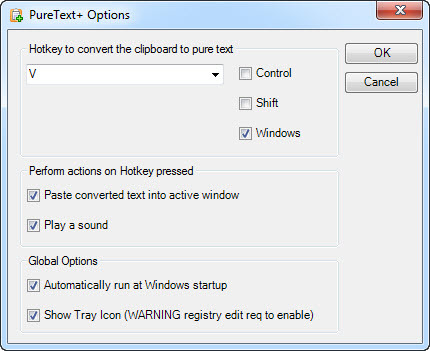 Nevermind, the original PureText is alive and well, in new PureText 3.0 form, now fully Windows 8 compatible. Seems to work quite nicely, allowing me to go back to my original Win+V shortcut for plain text paste. Thank you, Steve Miller!